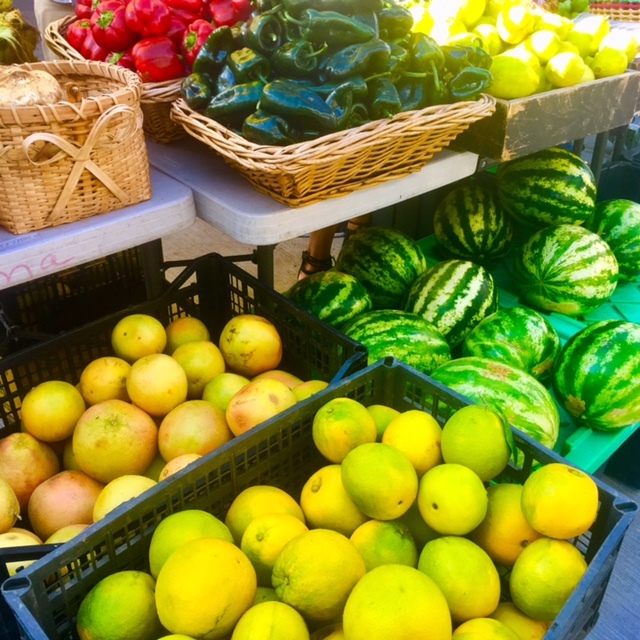 We are so fortunate to have the organic market half a block away from us on Wednesdays and Saturdays. On Wednesday, Manuel had the most beautiful blood-oranges, so I decided to try a new cocktail that evening. 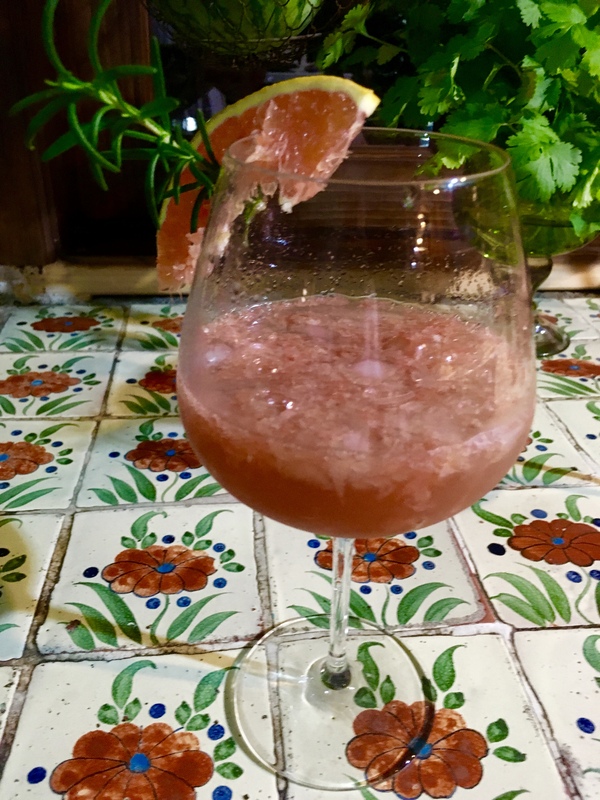 I saw a recipe that inspired the drink on the Food & Wine website – it used both blood-orange and rosemary, of which we have two large bushes of. Put desired amount of crushed ice in each wine glass. Add the blood-orange juice, Campari and rosemary simple syrup. Mix and top with the Prosecco and garnish with the blood-orange slice and rosemary sprig. *To make the rosemary simple syrup, stir together 1/2 cup sugar, 1/2 cup water and 2 fresh rosemary sprigs in a medium saucepan over medium-high heat. Bring to a boil, stirring occasionally, and boil for 1 minute or until sugar is dissolved, Remove from heat, and let stand 30 minutes or until cool. Pour liquid through a wire-mesh strainer into an airtight bottle, discarding rosemary sprigs. Cover and chill. Syrup may be stored for up to a month in the fridge. Tagged blood-orange, Campari, cocktail, garnish, grapefruit, organic. market, Prosecco, rosemary, simple syrup, sugar. My Mom and I were shopping for wine the other week and we were checking out what tequilas the store had in stock (my Mom LOVES tequila and together we toast every full moon with it, in person or by phone). The person in the store asked if we had tried Ungava Canadian Premium Gin (I know – how did we get from wine to tequila to GIN!). I love a gin and tonic when it’s really hot outside and had not yet tried this brand. The clerk at the liquor store was obviously very convincing as we ended up walking out with a bottle. We sat down to play a long awaited game or two of dominos that afternoon and poured ourselves a gin and tonic. I have to say that this gin, which I had put in the freezer so was ice cold when we made our drinks, was absolutely delicious. 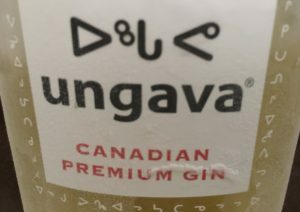 Ungava’s unusual bright yellow color and distinctive aroma are derived from six rare botanicals that are native to the Arctic region: Nordic juniper, wild rose hips, cloudberry, crowberry, Arctic blend and Labrador tea. These botanicals are handpicked and steeped in the traditional Inuit way and the result is a deliciously well-balanced, fragrant and delicious product. Ungava gin recommends serving with a wedge of grapefruit on ice, but do be careful as it has a surprising alcoholic strength of 43.1%. We tried it with chilled tonic, with and without a squeeze of fresh lime, and preferred it without citrus as the flavours are so unique and balanced. Perfect for an ice-cold martini, this unique handcrafted gin is definitely worth searching out – even if you have to come to Canada to find it! Tagged Arctic, Arctic blend tea, aroma, botanicals, Canada, citrus, cloudberry, color, crowberry, delicious, dominos, fragrant, freezer, full moon, gin, grapefruit, handpicked, ice cold, Inuit, Inuktitut, Labrador tea, line, martini, Nordic Juniper, steeped, tequila, tonic, tradition, Ungava, well-balanced, wild rose hips, wine.